Cassie Geisenhof died on April 12, 2004 due to complications related to a liver transplant which was necessary following liver failure caused by the anti-depressant Serzone (nefazodone). Cassie was just 19 years old when she died. Cassie’s tragic story and unfortunate death was featured on the CBS Evening News with Dan Rather in April 2004. Our law firm had the privilege of representing Cassie for her Serzone case; Tom Lamb was Cassie’s lawyer. As reported on CBS Evening News, Cassie Geisenhof first started taking Serzone in March 2000, when she was 15-years old. 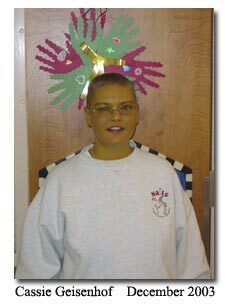 In August 2000, after several days of jaundice as well as nausea and vomiting, Cassie went to her local hospital in Minnesota. Cassie was diagnosed with hepatitis and liver failure. Cassie was flown to the University of Minnesota Hospital, where it was determined that Cassie required a liver transplant because of the liver failure. In the years following her August 2000 liver transplant, Cassie experienced various medical complications which put her back into the hospital on numerous occasions -- often for several weeks, and sometimes for months at a time. Cassie’s final hospital admission began on Christmas Day 2003, and she remained at the University of Minnesota’s Fairview University Medical Center until her unfortunate death in April 2004. Besides CBS News, the advocacy group Public Citizen has put the spotlight on the dangers associated with Serzone, an antidepressant manufactured by Bristol-Myers Squibb. Because of adverse side effects and drug reactions, Serzone was removed from the market in Europe and Canada during 2003, and Serzone is scheduled to be taken off the market in Australia and New Zealand in May 2004. With Serzone withdrawn by Bristol-Myers Squibb in these markets, the United States will be the only country where Serzone is sold. A Public Citizen review of FDA reports covering the period 1994, when Serzone was first marketed in the US, to May 12, 2003, revealed that Serzone was associated with at least 55 cases of liver failure, including 20 deaths. Now, with the death of 19 year old Cassie, it appears that the number of deaths has to be increased by one. Hopefully the FDA will soon order a long-overdue recall of Serzone so no one else will have to suffer and die like Cassie. Our law firm currently represents several other people who have developed hepatitis or liver failure while taking Serzone. If you need an attorney to investigate a possible Serzone-related injury, please do not hesitate to contact us. Our toll-free number is (800)426-9535.